There are almost endless ways to advertise your cleaning business. There are the typical formats such as newspaper ads and the yellow pages. There are more unusual types of advertising like billboards and sponsorships and there are what used to be referred to as Guerrilla Marketing. The Father of Guerrilla Marketing, Jay Conrad Levinson, thinks of it as achieving conventional goals with unconventional means. The idea is to stand out and to do so with little to no money, just by being creative. Get out in front of people in interesting and unusual ways and they will remember you. There are two approaches I recommend you apply simultaneously. The short term effect and the long term effect. When you market creatively it has more of a long term effect, it creates a reputation and a saturation effect. When you purchase an ad or print a flyer, the effect is more immediate, it is targeted. You want to do both. You need to get momentum and make money as soon as you can so that you achieve stability. You want to long tail it and build slowly and expand so that you achieve longevity. Don't just think in terms of spending money, in fact, the most effective ways to advertise is just to be out and about, making yourself available and interacting in your community. Let's start with some standard short term tasks. These are the standard ways of advertising a cleaning business that we are all aware of. Even so, it is amazing how few businesses do these typical tasks. 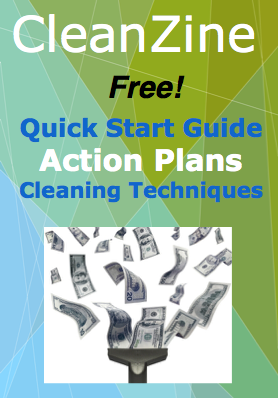 Sing up for our free CleanZine and find out the typical advertising norms you should avoid! You do not want to waste your time on outdated concepts that do not deliver. One of those is newspaper print ads. Sign up for our newsletter to find out why. You know the ones, you are likely already on some of them. If not, then you need to buck up and get involved. Gone are the days of just skipping out on the tech of the day, there is too much competition out there and they are beating you up in the branding domain if you are not on social media. You have to have a weekly presence on these social networks. You need to point them to your website! Don't have just a social media presence, because then people will get distracted on that particular network and wander away, send them to your website, then convince them to hire you. Our cleaning business system has a dozen great tips for best practices with social media networks and your cleaning business website. We have been using the Internet to advertise and market since 2003. One of the most fun and least expensive ways to promote your cleaning business is to just be out there doing stuff! Just go out a do different activities and interact with people and of course 'what you do' will eventually come up. It's natural and very effective. Do not just spend money on ads and sit at home hoping that will suffice. It will not! Sponsor some local activities and fund raisers. This is one of the best long-tail tactics that will not only get you business but build your reputation. You will also feel good about yourself and contribute to making the world a better place. We have dozens of clever time tested ways for your to advertise your cleaning business. Please sign up for our newsletter to learn more.